Breaking News: Pluto is the Largest Dwarf Planet! Pluto (right) and Charon (left) as seen by New Horizons, July 12, 2015. Credit: NASA. But we already have some photos that are just good enough to give us a good idea of what Pluto and its giant moon, Charon, look like, and the results are surprising. 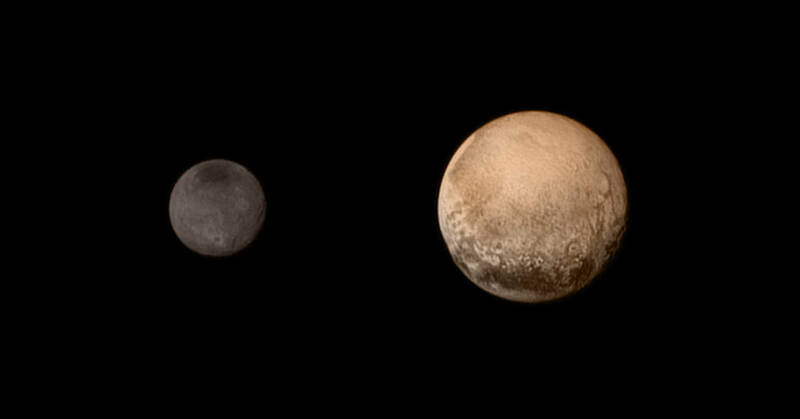 Pluto is an odd tan color, while Charon is slate-gray. Pluto has a large heart-shaped light area and a band of dark splotches. Charon has one weird dark spot at its north pole and chasms larger than the Grand Canyon. We don’t know what these features are yet, but we should soon. There’s one big new surprise, though, which is that Pluto is larger than we thought. 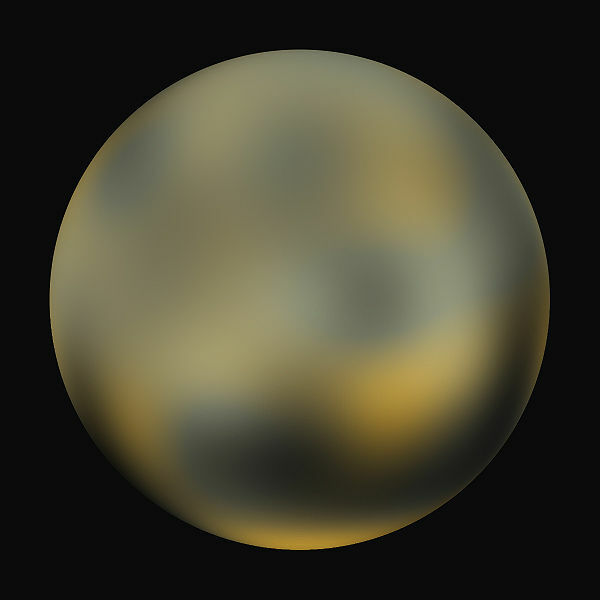 With the first ever good pictures, we now know that Pluto is 2,370 kilometers (1,473 miles) in diameter. The event that triggered Pluto being demoted from a planet to a dwarf planet was the discovery of Eris out beyond Pluto. But Eris is only 2,326 kilometers (1,445 miles) across. So Pluto is the king of the underworld Kuiper belt once again! Well…not so fast. Pluto may be bigger around but Eris is still 27% heavier. How is this possible? Eris is denser because it’s mostly made of rock, while Pluto has a lot more ice, making it bigger despite being lighter. But there’s a twist to this. Pluto reflects only about 60% of the light that hits it. That’s pretty normal for ice and a lot more than most other natural surfaces. (Earth reflects 30% and the Moon only 11%.) But Eris reflects a staggering 96%! With those kinds of number’s you’d expect Eris to be covered in fresh-fallen snow, except it’s too cold for any common chemical to snow there. Mike Brown (the astronomer, not the football player or the guy who was shot in Ferguson) speculates here that a red color (redder than Pluto) is caused by methane frost slowly turning to tar under the exposure of the feeble sunlight, so Pluto may have some of that to explain its color, but Eris is something of a mystery. Unfortunately, at more than twice as far from the Sun as Pluto, Eris won’t be getting a visit from a spacecraft any time soon. Next post, I’ll show the results of New Horizons’s encounter with Pluto, and after that, I’ll take on what may be most most controversial subject: why Pluto really shouldn’t be a planet (sorry, Pluto fans). This entry was posted in Current events, Space, Space exploration and tagged dwarf planet, eris, new horizons, planet, pluto. Bookmark the permalink. 1 Response to Breaking News: Pluto is the Largest Dwarf Planet! What an exciting era for space exploration! I must agree, though, that even with its bigger size Pluto and other Kuiper Belt Objects shouldn’t be planets. But in the end, whatever we decide to call them is arbitrary and the science we will get from New Horizons will be just as meaningful whether Pluto’s a planet or not.